Show starts with campers enjoying a ghost story. They hear the one counselor yelling, bright lights, and a car battery drops out of the air. They find the counselor floating in the air. Coulson is doing another physical. 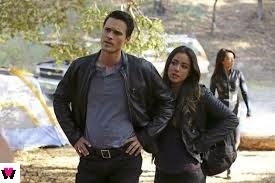 Skye is starting to get annoyed about her inability to make things right with Ward. Simmons and Fitz both pull a Ward impression. The crew goes to investigate and find the body still floating. The body zaps a little shock at Simmons then it drops to the ground. Coulson calls Ward out for being so hard on Skye. Another electro static signal has occurred. May, Ward, and Coulson check it out. Another floating body is found. The gang show up to the fire house. There is an iron mask. The one guy says he hears humming just like the first one. May finds a helmet that had an alien virus and they became infected as they were cleaning it. Coulson talks about his death to the dying man and walks out. The man dies as they were unable to stop him. Coulson tells Simmons to find a cure. 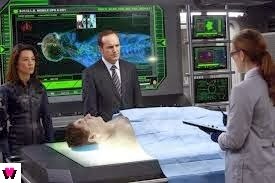 As Coulson talks to Simmons he notices a piece of metal floating. She realizes the virus spreads through shock and not really person to person. Coulson puts Simmons in quarantine. Danger! They might not be able to find somewhere to land before Simmons shocks the plane out of the sky. Simmons and Fitz worked hard and fast to find a cure. Coulson is told to dump infected cargo ie Simmons. He says there is a bad connection and ends it. Simmons and Fitz fight out of frustration. You can really see the connection between the two. They realize they can use skin cells from inside the helmet. Fitz runs into the quarantine room because he knows he has to be there to help his partner. They fail at the serum from the cells and Simmons admits to her demise. She knocks Fitz out and lowers the cargo hold to leave. She is standing on the edge and jumps. Turns out the serum worked and the mouse was just knocked out. Ward grabs the serum from Fitz, grabs the chute, and jumps. Coulson yells at Simmons for jumping and he says he would hate to lose her. The yelling comes from a place of fear. Coulson and May talk. Coulson ordered the physical test himself and he admits he feels different. She points out the scar on his chest and how dying changes you. 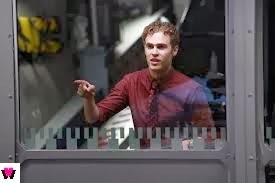 Simmons lets Fitz know that he is the real hero and says thank you. Coulson lets Blake know that he is changed and to get used to it. Why in the world does the other counselor take the kids to find the missing one. Isn’t that just the start of a horror movie? That is just foolish. I enjoy the camaraderie between Fitz, Simmons, and Skye. They continue to build the relationships of the team. I enjoy that May is one of the muscles of the show. She is a woman that can handle her own and help to save the day. The victims are connected as they are from the same firehouse that responded to the incident in NYC. Great episode as they truly give more of a story line to Simmons and Fitz. The interaction between the two adds a nice layer and develops their characters. I wonder how long it will be before they let it be know what happened with Coulson. I think the May conversation was a way to throw us off the scent but I personally think it is something more. We shall wait and see. S/N: I meant to blog about this but I will just mention it here. In the upcoming weeks, Shield will have episodes that continue the story line of the new Thor movie. 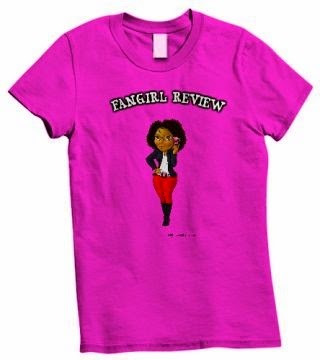 So go check out the movie so you are ready for the new story lines. I must commend Marvel for connecting all their movies and now tv show. Imagine how powerful they will be if they had control of Wolverine, Spiderman, X-men, and Fantastic Four. They are waiting to get those rights back and when they do it will be over for everyone else! They just got back Ghost Rider and Blade so I am sure they will appear in the new Avengers somewhere.